This is the most important gift guide post! Right? Fun gifts for kids is a must, since this is their favorite time year. I have some new ideas which I think you’ll love! Brick Loot – attention LEGO fans! I have a surprise box subscription for you! Receive a monthly box filled with unique, custom and never-before-seen items that work with LEGO bricks and custom building. 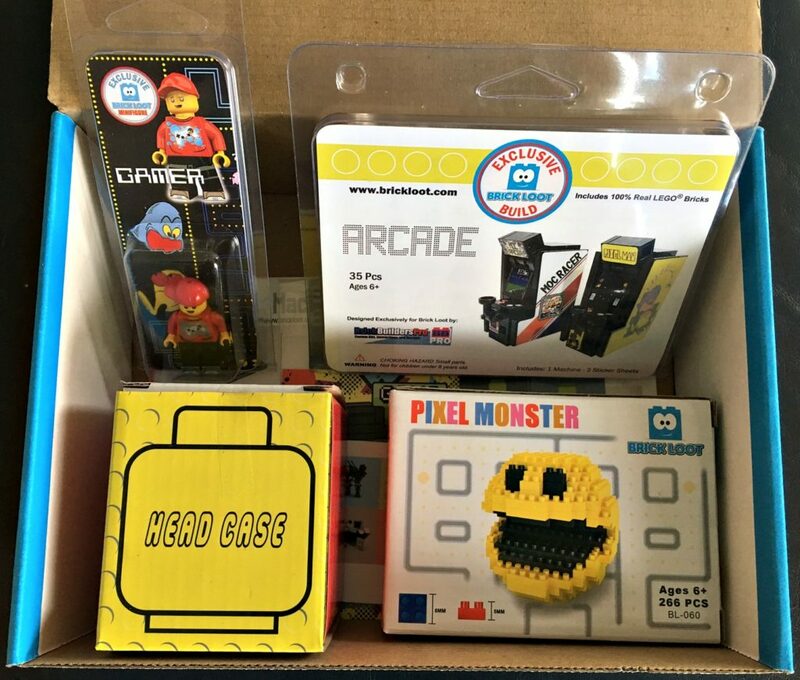 Each month your Brick Loot box is filled with 4-8 items that were hand picked by Brick specialists who scour the world for the newest and coolest products for you to collect. Not only are you wrapping up the first box, but each month another box arrives at your door. What kid will not go nuts over that! Whittle Shortline Railroad – chugga chugga choo choo! Handcrafted wooden toy trains made in Missouri by father and son. They are made with child safe paints and finishes. 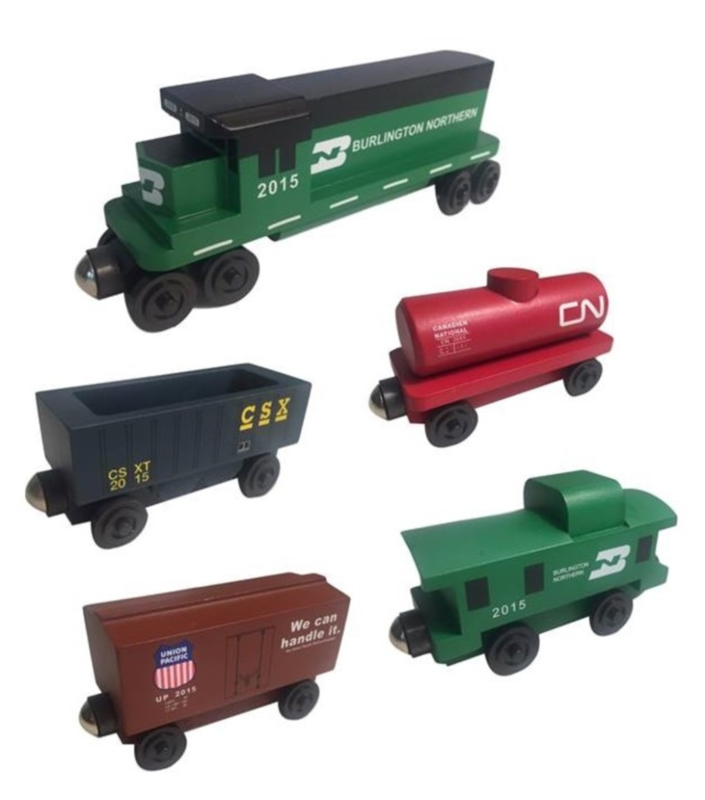 They are modeled after North American trains and sets include freight trains from Burlington Northern, CSX, Canadian National, Norfolk Southern, Santa Fe and Union Pacific among others. I think they are wonderful and so real looking! I bet you will still have them years down the road…or track. Don’t worry they are compatible with major wooden railways like Thomas, Brio and Chuggington. Receive 20% Off High Quality MIXED 5 Car Diesel Engine Toy Train Sets til Dec.11th when you enter Promo Code: WeLoveWhittle! in comments section at checkout at WoodenTrain.com. 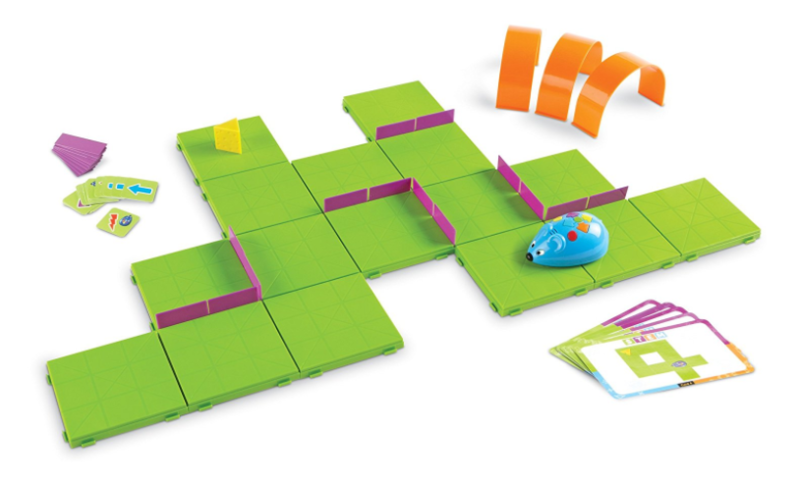 Code & Go Robot Mouse Activity Set – STEM game from Learning Resources. Starting at age 5, it’s time to introduce your child to the fun of coding and puzzle solving with this colorful, programmable mouse and maze. With Colby, the Robot Mouse (who makes sounds and lights up! ), learn to build simple mazes and then program the mouse to get the cheese. There are endless ways you can build the maze, which means the game – and learning! – never gets old. Who knew you could start to play with Coding at such a young age and make it FUN! Even my 12 and 14 year olds will get a kick out of this. It has good reviews on Amazon! Thermos Brand FUNtainers – food storage that will last! Do your kids come home and tell you what all the other kids have their lunch boxes? Mine do! With the cute Thermos Brand FUNtainer line your child will not only be stylin’, but their drinks will remain ice cold and their soups warm. We use these every single day. A must have! I love the designs. You’ll find Disney, Star Wars, Paw Patrol, Shopkins, Batman and more! The plain colors are great for the older kids. Find them all for good prices at Amazon. Disney Movies – perfect additions to your collection for family movie night! Finding Dory. We just watched it this week for the first time and it’s cute cute! Nemo and Marlin travel the ocean with Dory to find her parents because she is starting to remember. There are three new characters to love – Hank, a cantankerous octopus; Bailey, a beluga whale who’s convinced his biological sonar skills are on the fritz and Destiny, a nearsighted whale shark! The BFG. Can not wait to watch this! We were supposed to watch it in theaters, but didn’t finish the book in time. It was P’Diddy’s first chapter book by Roald Dahl (a fantastic kid’s author!) that I read out loud. Directed by Steven Spielberg, a young girl Sophie, crosses paths with a mysterious giant, the Big Friendly Giant. You will giggle at the giant’s language and be amazed at how brave Sophie is. They have a phizz-whizzing journey together! You will know what that means once you watch! Pete’s Dragon. I don’t personally know a lot about this one yet, but when there is a dragon involved I know my boys will love! When a mysterious 10-year-old boy, Pete, turns up, claiming to live in the woods with a giant green dragon, it’s up to a forest ranger, Grace, and young Natalie to learn where the boy came from, where he belongs, and the truth about this magical dragon. Fill me in, have you seen it? Coco Color – super excited to show this off! Every time we travel I make sure we carry a bag with each colored pencil and crayon that the kids would need. Red, orange, yellow, green, etc. Not anymore! This stylus does it all – 48 colors with 4 brush style sizes. 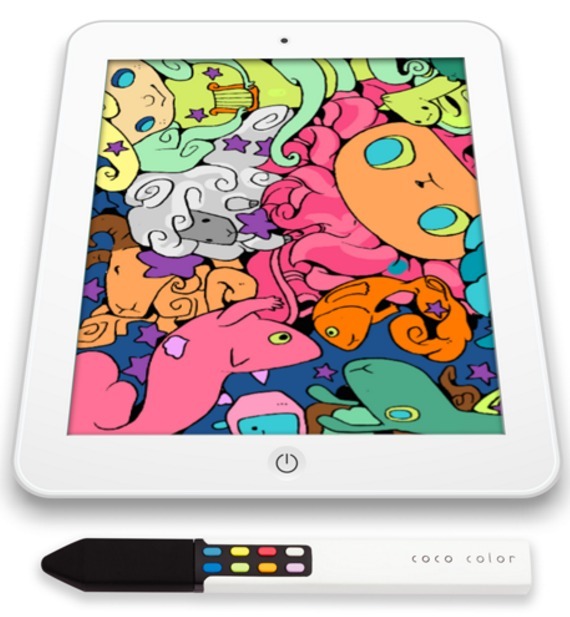 Use it with the two Coco Color Apps – one is made for doodling/drawing and the other is coloring! You work your way through a ‘Voyage’ which consists of 9 color pages that go together to form one large masterpiece. Not sure who has been using this more – me or the kids! I love it while we watch TV at night to keep my hands busy. I’m working on the On the Sea Voyage! O’Bear has started Outer Space and P’Diddy is coloring In the Jungle. Please note that is not made for the little-little ones because you need light pressure to use it and they can be rough, but a little-kid friendly version is coming soon! What fun gifts for kids are you getting them this year? I partnered with these Gifts for Kids brands for this post and links may be affiliate. All opinions are my own. This giveaway will end on December 7, 2016 at midnight MST. Winners will be drawn via rafflecopter. Once a winner is drawn I will contact them and they will have 48 hours to reply before I draw a new winner. Giveaway is open to anyone in US and you must be 18 years of age or older. Giveaway not affiliated with Facebook & I release them of liability. Winner will be posted in the rafflecopter widget. Sadly those darn Hatchamals are what seem to be wanted, but I prefer to give the kiddos something they think is fun but is actually more artsy or a learning toy, something to grow their imagination with like the coco color stylus, love it when they create pictures and designs for me! The Coco Color looks fun and different! I have 5 kids and they all want different things. They all would enjoy watching Finding Dory together. My 3 yr. old wants everything it seems and my 10 yr. old daughter would like a Wii U or an XBox One. My kids have a pretty good list. Top toys wanted are nerf guns and a Hatchimal. My 15 year old just told me she wants the Hamilton Mix Tape and a four pack of nice root beer. Everything on this post looks good. We don't have Dory yet so that would be a big hit. Everyone in my family would love Brick Loot! Haha We are a Lego-loving family. Our dream is to someday vacation at Legoland (the real ones, not the Discovery centers). My kids would love Finding Dory. They also would love Paw Patrol stuff. My son wants a hatchimal and power rangers toys. My girls want clothes and gift cards. Once the kids get older they don't really ask for much. Thank goodness for the little one! The Disney movies look like something my kids would love to receive. They also asked for several of the Shopkins and some Trolls. Al of those Disney movies are on our wishlist! The coding mouse robot activity center looks like a lot of fun! My grandsons are hoping for 12 volt ride on vehicles this year! They would love to have these movies, too! My daughter wants Shopkins , I love the movies , My whole family loves to watch movies together. Terrific package of items -- my granddaughter loves Dory so that DVD would be a big hit. My granddaughter would love Calico Critters, but my grandsons would love the Whittle Shortline Railroad as they love trains. My grandson would love the train. He likes any mode of transportation! They want the movies. They really want the BFG movie. I want to try that Coco Color. That looks pretty cool! My kids love movies and I spend so much money buying them. That's why they would love the movies you listed! I can't wait to read the BFG with them and then watch the movie. Awesome giveaway! The kids didn't ask for any of those. We have soccer goalie gloves and a Georgie Dog. But those movies would be awesome for our Friday movie nights! Thanks so much! My son wants Legos this year. My son loves Legos, trains and Finding Dory. This would be a great giveaway for us to win. My daughter wants some HotWheels and Xbox games. She also asked for a crossbow. She’s eight in a few days. I’m thinking maybe a Nerf bow, lol. She’d like the Coco color stylus. Coco Color?! Where has this been all my life? This is the perfect gift for my kids...I hope they come out with a "little kid" friendly version soon! The kids love Finding Dory, and we don't have our own copy, so this would be perfect for them! Thank you for the chance to win! That multi color stylus is cool! My kids would love the movies,especially Finding Dory,they adore her and so do I! My girls have dolls and pokemon on their list! Disney movies are a great idea for gifts! My kids want Hatchimals but thats not gonna happen .. The boys want hot wheels this year. The Petes Dragon video looks great. the brick loot and the coco color looks like they would do the trick. My daughter loves legos and art. I have never seen or heard of this color but it looks awesome. Of course thoug, my daughters top list item is a cell phone lol. Disney movies would be amazing as a Christmas gift my family love Disney movie. I would like the Thermos Funtainer for my son. My kids love movies! We also love to play Xbox games like Skylanders. My oldest wants makeup, middle wants basketball pole, middle wants laptop, middle wants iphone, youngest wants ipad. Me I want all my wishes to come true within my lifetime. without any negativities attached to them. That Coco Color looks awesome! I may even want to use that! The thing kids want this year are Hatchimal and Drawing neon pads. My kids would like a new bike this year. My daughter wants doll accessories and my son more wants a PS4. The Thermos would be great , great to take to sporting events. This is a completely awesome giveaway. We love the movies you have up for grabs, especially Finding Dory. We love her and Nemo. She wants a minnie mouse stuff animal. The Coco Color looks awesome! I have never heard of it before your post, but I definitely want to get it for my oldest daughter this year! Thanks for sharing. :) I also plan of getting my son an activity table for his cars and trains. The Coco Color is amazing! I have a little artist in my house who would love that! And I love the no mess part! I think Finding Dory is a great gift!!! my kids would be sure to enjoy the coco color. My son wants paw patrol. And my daughter is clothes obsessed. My son has been asking for Legos this year. My son just wants cash, but that's going to be difficutlt. My daughter wants makeup. I love the food storage containers! They would be a great help for us, especially when we are on the go. And of course the movies will always be a huge hit in our home. We love movie night!! This whole giveaway is awesome! Thank you! The movies! We are in the car a lot! (WHO ever it was that came up with putting a DVD player in the car was a GENIUS!) new movies would be so awesome!! Thank you for the chance!! I know my grandson would love the coco color. This is just a marvelous toy. My son is begging for an iPad but he is only 7, too young I think. My 2 yr old wants anything that has to do with Mickey Mouse. Everything looks great! So much i want for my kids! My kids want various types of things, one wants a bike, some want a tablet. Oh the kids for sure would love all these this year for Christmas. I think she wants and American Girl Doll and he wants anything Lego! My Grandkids would love any of these. They love Dory and watching movies. We haven't seen any of these ones yet. The thermos are great and would come in handy for their lunches. Happy holidays to all. Whoa! That stylus is amazing! I was just talking to my hubby about finding something like that for our daughter. The kids want electronic devices Nook ,Amazon Fire etc clothes and other fun games too. My youngest son wants Skylanders or board games for Christmas. My daughter wants anything anime or Pokémon or video game or art related. My oldest son goes for DVDs, video games or art supplies. The Coco Color really catches my eye. It looks like something my daughter would really enjoy. My kids want everything this year that they see! Lol. Dolls, tablets, games, etc. Great list of gift ideas! My kids love games and a couple need replacement water bottles for school. Love the thermos brand ones! legos and brain teaser type games are fun gifts to give. Thanks for ideas! Any of the new movies that have come out, especially the ones you suggested would be great for the kids. Also get secret life of pets movie. My ones are into robotics this year and science experiments. My boys are asking for dinosaur related toys but also the movie Finding Dory which was a hit with my two year old. They want LEGOs and anything airplane! Thank you for the chance to win! The Code & Go Robot Mouse Activity Set – STEM game from Learning Resources looks great to me as a Homeschooling mom. My kids would probably love the movies too. I would personally love the thermos and food containers for myself and my little boy! My kids are asking for the latest video games. This coco color looks like a nice entertainment and learning toy. My daughter wants a Hatchimal this year! Coloring tablet looks so awesome!!!!!! Of course my 15yr old wants an iPhone lol my 2yr old definitely wants something Peppa Pig for sure lol my 11yr old is into Shopkins and my newborn is just starting to play with soft baby toys:-) ENTERED:-) ty in advance!!!!! My daughter wants a Hermione Granger Hogwarts outfit for her American Girl Doll. I love the Coco Color! That's so awesome and perfect for my crafty kids! My Grandson wants a new BMX bike and a Drone. My son wants Skylanders Imaginators and board games. We all want Finding Dory on DVD this Christmas! My grandson could use these for his lunches: Thermos Brand FUNtainers. Finding Dory is on our list this year! My 1 year old son is too young to want anything at this point, so I get him cute little outfits that I know he won't let me put on him when he has a say so. ;) This gift package would be gifts for my 2 neices who are 12 and 11. My daughter wants shopkins house and my son wants anything boyish. I like that Coco Color. That's a great idea! My grandkids have not really told me what they wanted for Christmas. The Thermos looks pretty cool. They might like that. My Grands want Video Games & to go to Disney World. They would love anything to do with finding dory and a hatchimal! 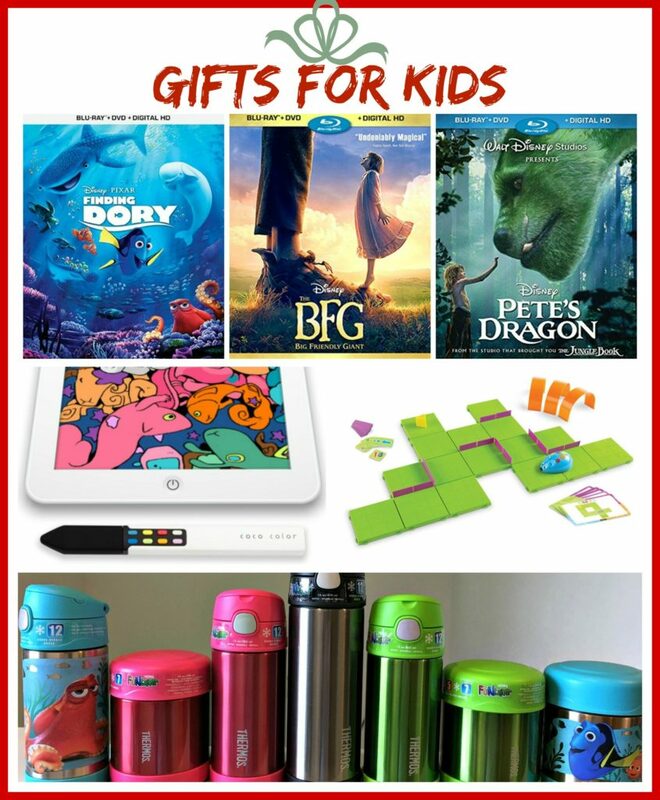 Our kids would love the movies and the Thermos products! That Coco Color toy looks like a lot of fun! My kids love movies & the thermos is good for lunches! My daughter is wanting a tablet this year, my niece would love the pixel monster. I think my niece and nephew would love the movies! They are excited about all things Trolls this year too. Finding Dory would be super popular in our house! We love movies! My grandson loves anything Disney Jr and Finding Dory would be a big hit with him. My son is wishing for technology. He's too young for a phone. But wishes for an iPod. My kids want pokemon stuff (just got into it recently), clothes (have a few pre-teen/teens), boots, gift cards, and video games. I like the Coco pen, I have never seen this before - looks like a lot of creativity. The Pixel head and Brick Loot also look like something my boys would like. My daughter wants video games. She is obsessed with colors & color mixing so that Coco Color is way cool! If I don't win it, it might just be something I get for her anyway. Thanks for the review & the chance to win! My son wants anything Lego. I know he'd like the "Pete's Dragon" movie, too. The PacMan Lego thing looks awesome! My daughter is big into Legos this year and Pixels is still one of her favorite movies!! My grandkids want Shopkins, Pokémon anything and Barbies. I can't get my daughter to tell me what she wants but my granddaughter for sure has a list for Grandma & Santa! I love the Coso Color! The Lego box subscription is a great idea. It's the gift that keeps on giving! The kids are into movies this year. The Finding Dory and Pete's Dragon would be of the greatest interest and desirability to them! My boys wanted their own geocaching accounts and memberships so they could start tracking their own geocoins and see how far they traveled! =) I'm super excited about the movies... Really been wanting to see Pete's Dragon! They want games for Christmas.